A little more news is filtering out about the Lamborghini Egoista supercar concept. First of all it's not called the Ecosta. That mistake came from English journalists listening to Italians saying the word "Egoista." We also know it's powered by a 5.2 litre V10 which produces 570hp in other Lamborghinis. Egoista in Italian means selfish which in itself is derived from the Latin ego, or I, which is quite appropriate because the Egoista has just one seat. Have Lamborghini gone too far with the Egoista? It's less powerful than the 740hp Veneno but the slashes and lines and front end trident are pretty extreme. Many commentators have called it hideous, although the rear end is quite conventional. Ferruccio Lamborghini made his fortune building tractors - and the idea for the company in the first place came from when he purchased a Ferrari 250 GTO and the clutch failed, he discovered the clutch was the same as he used on his tractors. Ferrari took umbrage when he pointed this out and told him he knew nothing about sportscars as he was only a tractor maker. Ferruccio then set up his own sportscar business to make a better car than Ferrari could. 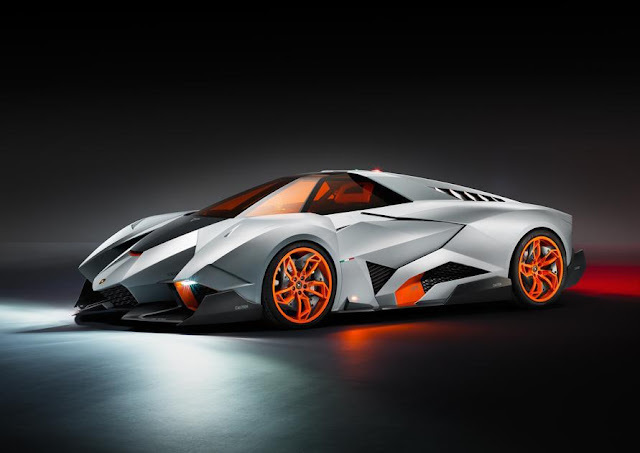 The Egoista celebrates Lamborghini's 50th anniversary as a car manufacturer. Maybe that central single seat, and the plough-like front splitter also celebrates the history before the sportscars, when only tractors bore the name Lamborghini? Maybe not, but it'd be a nice touch if it did.